The primary specification of the follower-type pressure die is its length, which is a function of travel and material rigidity. A formula for pressure die length is: L = (r x 3.14 x (b/180)) + (t x k) where “L” is length, “r” is centerline radius, “b” is degree of bend, “t” is tube diameter, and “k” is a constant for rigidity. For most round tubing, 2 is a good value for “k”. Increase “k” to 2.5 to 3 for rigid materials such as nickel stainless, titanium, and superalloys in round tubing, 3 to 4 for easy-way bends in non-round tubing, and 4 to 5 for hard-way bends. The purpose of this rigidity factor is to ensure that there is a sufficient length of pressure die behind the line of tangency at the end of the bend to hold the tube true to the Y-axis of the bending machine. On most bending machines there are two settings controlling the operation of the pressure die: direct pressure and assist pressure. 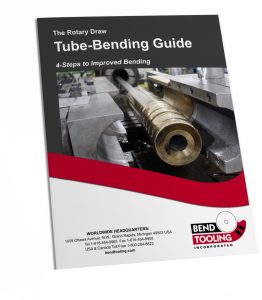 To reduce drag on the point of bend direct pressure must be kept to the minimum necessary to hold the tube without it separating from the bend die cavity. A low direct pressure setting also improves the effect of assist pressure on the extrados of the tube. See the entries under direct pressure and assist pressure more information on these settings.